She refuses to ask intelligent questions about his vast knowledge of climate change, which brings him here, and instead employs a 30-year-old scatalogical yarn to mock him against today’s values. To assert that this spicy question was her most important raises to a virtue either mere vapidity or a taste to scandalise, neither of which empty urges sits well with the formidable tradition of the Herald. And why does she use the inferior phrase “pesky Argies” except to diminish the gravity of the deadly peril the Argentinian cowards had brought upon the British citizens in the Falklands and thereby to diminish Monckton’s own stature? Ahem. There was the episode with the youth activists in Copenhagen. He called them members of Hitler Youth. No, he didn’t. I didn’t happen to have the You Tube clip with me, so I amended this: He said they were being like members of Hitler Youth. Michele strove to avoid the substance of his “writing about climate change,” instead needling him over an altercation during climate talks in Copenhagen in December 2009. I revisited one of the videos. Some youthful environmental protesters, the previous evening, invaded a meeting Monckton attended and disrupted it with chanting, shouting and, according to Monckton, “shrieking.” Which were tactics adopted by the Hitler youth in the 1930s to intimidate the population. Ben Wessell, an environmental activist, said that the science of global climate change had been “settled” for 20 years, which meant that global temperatures had been rising. Christopher asked him whether they had been rising for the last 15 years. Wessell said that the “agreed trend” was that they had been rising. He had said he “believed” temperatures were rising and made it clear that he had not bothered himself to check the facts in the global datasets. Tempers frayed, as you might expect, as the exchanges became heated, but not noticeably. Only the petty-minded would still be criticising Christopher over this incident. Michele chose simply to bicker over the precise reference to Hitler youth and again ignored the opportunity to examine Christopher’s position on climate change. At the very beginning I had asked what was the correct way to address him? The forelock tugging was a joke, obviously, but I can’t help thinking his lordship would have preferred a little more of that and a lot less of the pesky asking of questions. It’s only fair to say it was all my fault for mistaking an audience for an interview. I can’t help thinking Michele prefers a little more that a well-spoken Cambridge graduate proves a vain, empty-headed fop and a lot less that he has a serious and well-intentioned message. It’s only fair to say this is my fault for mistaking a Herald writer for a journalist. To send this woman to interview Christopher Monckton after botching so badly their introduction of him to the New Zealand public was to add abuse to insult. Richard – you illustrate exactly the dishonesty and misrepresentation I refer to – a good reason to look to experts for information. I said there “could be” a fundamental flaw in our understanding of the properties of greenhouse gases – but because these are fundamental properties I could not imagine what such a flaw could be. Either can you. So don’t dishonestly cherry pick me to support your crackpot stupidness. Chemists understand the absorption/emission properties of such molecules very well – you don’t. I have yet to see any evidence that this understanding is flawed. None at all. Not even – in your words – “the current slow down in land surface temperatures”? 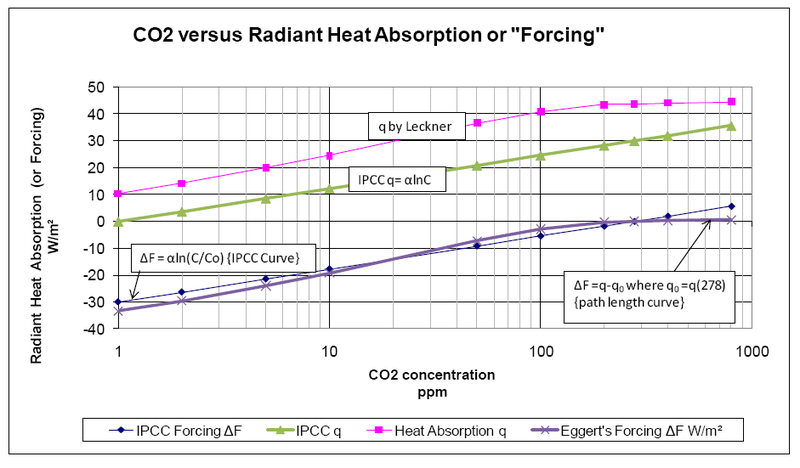 As I’ve shown by recourse to established radiative heat transfer science and the thermal characteristics of CO2 (not necessarily chemistry Ken), it’s climate science and the IPCC that have the misunderstanding, not the wider and more rigourous disciplines. 1996 by “Chemists” Ken i.e. back up your hand waving. BTW, bet you’re regretting that Freudian slip? A very frank and revealing disclosure in its inadvertence – getting doubts Ken (despite your backpeddling)? Rubbish. 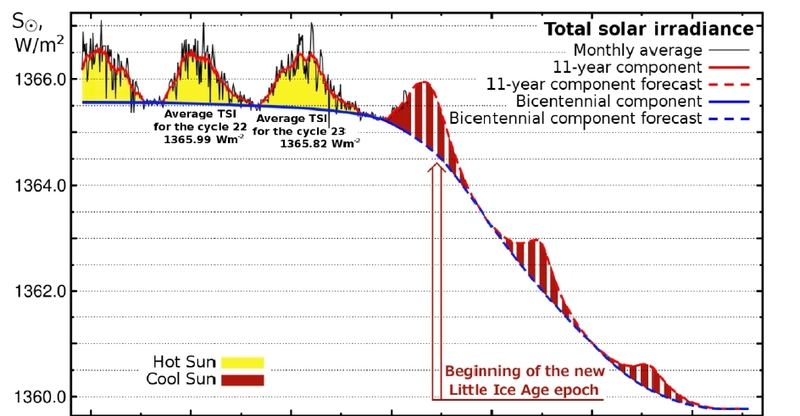 The upswing in temperature started post Maunder Minimum when TSI went from Grand Minimum to Grand Maximum levels that stayed elevated at the level of 1986 peak until about 2009. There’s planetary inertia to consider Simon, calculated as anything from 8 to 20 years (Abdussamatov, Usoskin, Scaftetta to name some) i.e. maximum planetary enthalpy does not occur instantaneously as demanded by warmists who have no fundamental understanding of the sun -> oceanic heat sink -> space system, it is lagged, Foster and Rahmstorf are classic cases of this ignorance. It is only now from 2012/13 onwards that solar output is going over a cliff, temperatures have up to now conformed with the 60 yr climate cycle. 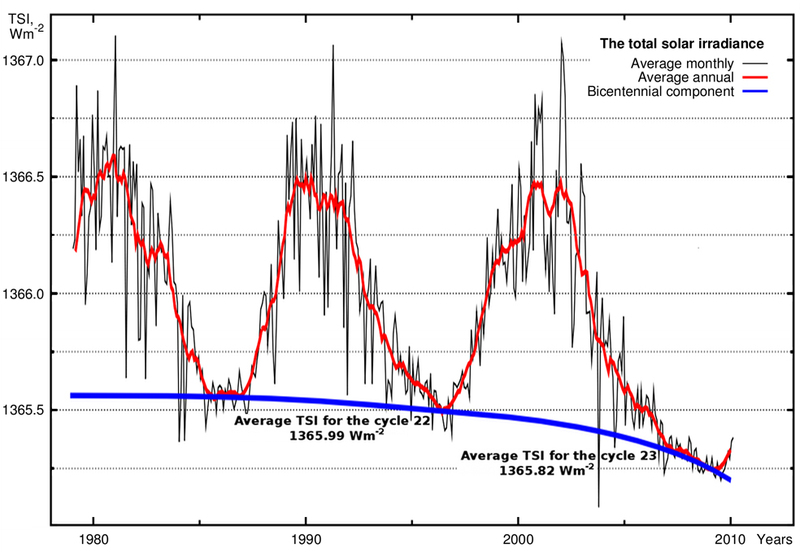 Now the quasi-200 yr solar cycle will take forcing precedence. GAT and SST are already on a cooling trend this century and OHC has reached maximum levels – it’s downhill for a while now out to the mid 2040s. i.e. there is no correlation so you need to create a lag and then vary that lag continuously to fit what you are trying to prove. Solar variation is only 0.1% or 1.3 W/m2 from solar maximum to solar minimum and is swamped by greenhouse gas and volcanic effects. Yes, thanks, RC. I had already found that and I’m disappointed that Ken couldn’t. It’s an unsupported assertion by Kashka Tunstall, the reporter, so it’s not reliable, and even if it is, what does it mean? From talking with Christopher over the last few days, although the chap’s obviously weary, having traipsed across Australia since January and with another three weeks to go in NZ, I saw nothing that said he was stopping public appearances. But I could be wrong, and he can do what he likes, so it would signify nothing about climate change. Research Topics e.g. Mathematical models based on CFD: The task is to develop models that enable us to predict turbulent flows occurring during chemical reactions. The models are used in various industrial processes in the energy using and chemical industries. Thermochemical applications requiring research of the thermochemical characteristics of combustion gases including CO2. “Which is great but if whatever article you find from some NASA site is relevent to the NASA climate change website then it’s probably already factored in by now. Otherwise, they risk being embarassed by some other scientific community..
Not even close Cedric and they explicitly state otherwise. If you’d read the NASA report you would have seen that. Then you have no problem giving the quote where they explicitly state that the article is relevent to the climate change website yet they have not factored it in yet. I’d like to read their reason why. Can you actually find it? The Dunning-Kruger Effect sounds just as interesting as the argumentum ad verecundiam, the argument from authority. It’s a convenient excuse, but in reality the reluctance to debate is rooted in fear. That does indeed seem to be the general reaction from creationists. I have no doubt that climate deniers would say the same thing. Or HIV deniers or anti-vaxxers etc. Besides, some people just don’t want to debate. Wrong. The lag is established scientifically. That is why I named Abdussamatov, Usoskin and Scafetta as examples of those doing the establishing. They concur around 12 to 14 years plus or minus up to 6 years for the major response. Obviously the response ranges from instantaneous (radiation reflection – response is relatively minor) to perhaps hundreds of years for the ocean, but just over a dozen years is readily detected observationally and by calculation (see Abdussamatov 2012 for calcs). Scafetta argues for the introduction of a two-stage response paradigm of 1 yr and 12 yrs for example and Abdussamatov’s range is 8 to 20 years. Big difference between that and the 11 yr variation. I should point out that Habibullo Abdussamatov is not just any solar researcher but along with solar observatory work is head of the Russian half of the International Space Station, their primary mission being study of the sun’s output. The good news is that although there was never observations from 1600 to the beginning of satellite era at a level achieved since the satellite era began (even then problematic and uncertain), solar science can now measure the sun’s output in real time as it goes from Grand Max to Grand Min. I’ve just been through the same exercise over the same misconceptions with Nick but in far more detail about a number of uncertainties even in the satellite era i.e. there is far more to it than this intro. I just wish you had followed that thread Simon, it would have saved me a great deal of time and effort. I hope after this you guys will have a better appreciation of solar issues particularly wrt AR5 and the IPCC’s less-than-exhaustive treatment of them. In any event, the CMIP5/AR5 GCM simulations have the wrong parameterization (apart from only including TSI – see ‘Solar Variability and Terrestrial Climate’) for the 21st century anyway. The TSI series they have used just projected constant early 2000s levels out to 2100 but after 2012 all that changed and although SC 24 is at 11 yr cycle max at present, that level is nowhere near the SC 22 and 23 peaks and predictions from solar specialists are for solar output to plunge over the next 30 years from the already abnormally low SC 24 peak. If GHG-centric climate scientists are puzzled by the 21st century hiatus (but easily explained by cyclicity), they’ll be dumbfounded by what’s to come. In a concluding panel discussion, the researchers identified a number of possible next steps………. They’re just getting started Cedric so obviously what has not been researched yet cannot be “factored in”. Cedric: Then you have no problem giving the quote where they explicitly state that the article is relevent to the climate change website yet they have not factored it in yet. I’d like to read their reason why. Can you actually find it? Richard, that’s , um, great but I was hoping for something, y’know, explicit. As in an explicit quote. Why the bait and switch? At least three people on this thread have accused me multiple times of using the Argument from Authority. And all that from just googling NASA? However, it’s an important issue so let’s examine it. Imagine (for example) if I got my history information on WW2 from the Holocaust Museum? Would I be guilty of the fallacious Argument from Authority? Or if I took my dentist’s advice on getting my wisdom teeth removed? Or if I accepted NASA’s account of Neil Armstrong landing on the moon? Well, as it happens, there’s a website that’s dedicated to combatting Holocaust Denial and they have a very hard look at fallacious arguments as you can imagine. The one on the Argument from Authority is especially good. According to that very detailed definition, by referring to NASA and every single scientific communtiy on the planet, I seem to be on safe ground. Really? That sounds quite interesting. Or important, so I might even look it up. There’s a rather good youtube vidoe on it too. I think the Dunning-Kruger Effect neatly matches up with the advice given by Feynman. This seems as good a point as any so I’ll leave it here. Thank you for your time and letting me reply to people. Feel free to contact me if you wish. Oops, sorry! Missed the last bit. Thought you were trying to pull a fast one. Well, if and when they get around to it then I look forward to them factoring it in if they think it’s relevent. Simon, you say “i.e. there is no correlation so you need to create a lag…” However, just because you cannot see a correlation does not mean others cannot. 1. exploration of the paleoecological indicator value of all available microfossils and macrofossils in fine-resolution palynological studies of lake deposits, fens, bogs and archaeological sites. 2. 14C wiggle-match dating and the study of ∆14C as a climate proxy (solar forcing of climate change and climatic teleconnections). So, Simon, there are indications from scientific studies that there is a correlation. Richard – the specific situation with global temperature is not at all evidence for a flaw in our understanding of the fundamental properties of these molecules. Only a idiot would say that. Global temperature is an extremely complex thing – incompletely understood. The influence of greenhouse gases is only one feature, although an important one for life on this planet. The fundamental properties of these molecules is well understood and well illustrated every day of the week. Com on – show me an IR absorption spectrum of CO2 to illustrate you Nobel winning discovery that our understanding of these molecules is so mistaken. What a fool – you are incapable of understanding such issues and of absolutely no value in discussions. 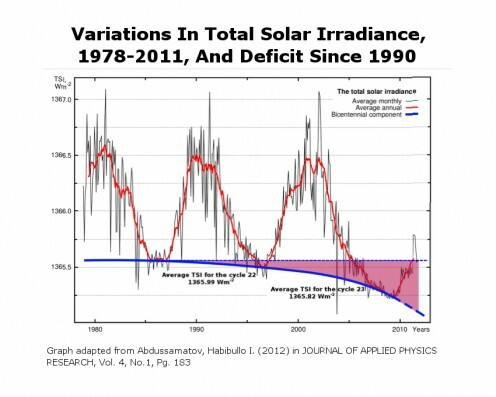 I agree that there is evidence for solar forcing in past history over long time horizons. Unfortunately there is no way that solar forcing can explain the recent increase in temperature despite Richard C’s verbiage. Oh, blast. What a shame he’s gone. I was just working up the courage to ask if he wouldn’t mind telling me about the Dunning-Kruger Effect in his own words. Just to give me an idea what he was talking about without wandering helplessly yet again all over the internet with this disability of being unable to discriminate truth from untruth, like him. But never mind. He probably wouldn’t admit that he knows anything, anyway. The issue is not the absorption spectrum (and I haven’t said it was – you’ve misunderstood as usual Ken), the issue is CO2’s performance as an energy transfer or forcing medium. The forcing is exhausted past 200ppm (see literature below) but the transfer properties are utilized in refrigeration and the thermosphere i.e. the notion that GHGs “trap” heat is only valid up to the point of thermalization (but only if it is re-energized) but after that the gas is an effective transfer medium (a coolant and used as such by industry). So far all you’ve done is misunderstand the issue, wave your hands, and hurl insults as usual Ken. Lets see some substance for a change. OHC has stabilized too consistent with maximum planetary enthalpy occurring at the end of the modern solar Grand Maximum around 2009 – 2012. There is now no forcing to take GAT or OHC higher. Ken, I have been very patient, but I am still waiting for you to make a rational response to the question I asked you re your use of the term ‘climate deniers’. I am very curious as to your rationale for using the term. My behaviour is to go to google and type in “NASA” and then type in “climate change”. I don’t see how that makes me a sheep. Your sheep-like behaviour is exhibited in your inability to think outside what the NASA website then tells you. You refuse to accept that any peer-reviewed finding is valid unless and until NASA tells you it is. You also refuse to accept that there is the possibility that NASA and other organizations may be made up of people wedded to an idea or position, people who cannot (for political reasons) abandon the idea easily, despite hard evidence contradicting that same idea. For NASA, feel free to substitute Royal Society, yada yada. That, my friend, is where you behave like a sheep. Stimulus, response, no brain. Yes Cedric, but it is nonetheless true that you ARE arguing from authority. Many peer reviewed scientific facts have been presented to you exposing the holes in AGW, but you just counter them by saying it can’t be right because NASA doesn’t say so. That, my friend, is an argument from authority – peer reviewed empirically proven facts are irrelevant, because NASA doesn’t mention them. It’s true, scientific institutions do back AGW, but many of the members don’t and it only takes one fact by one person to disprove a theory – e.g. Galileo ‘But it does move’ vs the scientific establishment of his day. Many scientists have resigned from the scientific institutions because they don’t agree with the institution’s official line on the matter. A scientific institution’s official stance on a matter does not make the matter right (as history has shown us over & over), and as a result of disagreement among the ranks of the institutions there is no consensus (not that a consensus makes it right either, as history also shows). The reason these scientists resign from the scientific institutions is because they know the points previously raised to you are empirical evidence that AGW is wrong. Many scientists don’t agree with the official line and have the facts to back them up through the peer-reviewed literature. The fact that NASA doesn’t officially & specifically mention these scientists or the facts as being right doesn’t mean they are wrong. The peer reviewed facts they present speak louder than an accepted official stance as we all learnt from Galileo’s experience, and it is due to these facts that more and more scientists are abandoning AGW theory & resigning from the scientific institutions that endorse it. Facts and observations speak louder than any scientific institution’s official stance, and any attempt to ignore obvious peer reviewed facts or the sound scientific conclusions they lead to raised by members of the scientific community in the peer reviewed literature because they don’t agree with a scientific institution’s official stance is nothing other than intentional & deliberate ignorance. In addition to this, an appeal to a scientific institution’s official stance on the matter is nothing other than the argument from authority, especially when the appeal intentionally ignores the disagreement within that institution on the issue. An argument from authority is not an argument at all, but rather an attempt to avoid the many peer reviewed scientific facts by those from the scientific community that prove the AGW theory untenable. In other words, your argument holds no water when confronted with the facts. The fact that you admit you’re too ignorant to understand the facts is the reason why you place your faith in a theory that has no scientific basis beyond a tiny warming of 1.2C maximum per doubling of total CO2 levels. Ignorance and its resulting argument from authority are nothing more than that – ignorance and an argument from authority, both faulty arguments when confronted by peer-reviewed scientific facts & conclusions from the scientific community. Observations and empirical evidence trump official stance & scientific speculation in the form of failed computer models every time, that’s the way science works, and that’s why support for AGW is weakening amongst the scientific community as evidenced by the revolt amongst the members of the scientific institutions. As for your faith in the institutions whose official stances are at odds with the empirical and peer reviewed scientific facts & many of their members, there’s an old saying – ‘ignorance is bliss’. But might I add that ignorance is no defence or justification, it is what it is – pure, unadulterated ignorance, made worse by the fact that it is intentional and deliberate. The real truth lies in the peer reviewed empirical evidence and the conclusions based on these scientific facts that are drawn by those in the scientific community who accept them rather over and above institutional dogma. This truth is what trumps any arguments from authority and the ignorance associated with it. A penetrating analysis, well expressed. Simon you’ve obviously been conditioned and misguided by a notion being disseminated by authoritative sounding but thermally ignorant sources i.e. that a “trend” correlation is required for solar output to explain 1980 – 2000 temperature – that is completely spurious. Those ignorant of oceanic heat-sink characteristics see that comparison and immediately but erroneously discount the solar driver but the explanation is oceanic thermal inertia, not solar output vs atmospheric temperature trend. First note that “Average” temperature reached maximum around 2004 and that “Average” solar output is at a maximum (relative to 1600s say) for the entire 1978 – 2009 period. Now for an analogy. You do not, for example, have to keep progressively turning up a stove element (rising trend) in order to heat a pot of water to the desired temperature. All you do is turn the element up from ‘Low’ to ‘High’ (if you want to boil the water) or ‘Medium’ if you just want to heat the water without boiling it (maximum heat input). The time lag from the initial introduction of extra heat by turning up the element (minimum temperature) to the time the water reaches a stable temperature (maximum temperature) is the thermal lag or inertia effect. Given that the sun heats the ocean and (predominantly) the ocean heats the atmosphere in the sun -> oceanic heat-sink -> atmosphere system, the same temperature profile occurs in both the solar heat source and the ocean as it does in the pot-of-water-on-a-stove-element analogy. This is the issue that Alec Rawls (AR5 reviewer) has been trying to get through to about a dozen IPCC solar specialists (“experts”) who although very knowledgeable about the solar side have no clue when it comes to oceanic thermal characteristics. Last I heard there is at least one of those solar specialists that has conceded to Alec but of the more prominent, for example Joanna Haigh, they cannot (or will not) grasp the concept. Consequently, the more scurrilous climate science misinformation peddlers driven by ulterior motives (e.g. Skeptical Science), are very active maintaining the solar misconception among more malleable minds. The lesson being that “experts” can be and often are, quite wrong when they venture outside their area of expertise i.e. they are then non-expert. And that relying on that non-expertise as your primary information source (let alone the promulgation of it by the less trustworthy) leads to fallacious understanding until their error becomes blatantly obvious as it is in the case outlined here. Richard, the fundamental properties relevant here relate to the symmetry and vibrational/rotational modes of these molecules. These are well understood as basic physical/chemical issues – with the chemists saying the most on this matter. These properties explain the greenhouse effect of these molecules, and why life is even possible on the planet. Without the greenhouse effect the temperatures would be very much lower. And these properties are fundamental to explaining emissions of energy involving these gases from the upper atmosphere during solar storms, or for engineering modelling of heat transport around flames. It is stupid to use any “slow down” in global temperatures which occur every so often as a “proof” that our understanding of the symmetry, vibration and rotation of these moleculeles is wrong. Very stupid. The hot links you keep quote show only how low your understanding is. You are like a monkey who has been taught to type, google and hot link. But you don’t understand the issues at all. Bloody hell, to say “the current slow down in land surface temperatures” is “evidence that this understanding [of fhe cundamental properties of greenhouse gas moelcules] is flawed” is bloody idiotic. Any discussion with such stupidity is a waste of time. 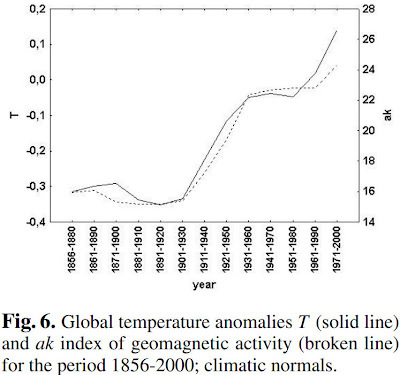 Global temperature is an extremely complex thing – incompletely understood. It seems that only now that the global temperature has hit a hitherto-unheralded hiatus has it become complex. Yet James Hansen said years ago it is impossible to discern a global temperature. He said it right there on his web site and nobody believed him. Still, at least now we all agree on something. Richard, that is a silly thing to say – have you not read the AR4 document, for example? This certainly stresses the complexity of the systems and discusses the question of the degree of confidence we can have in our findings. You can’t seem to help yourself – having the need to denigrate the science and honest scientists. Ken, your reply is attached to a comment above from Richard C, but your content seems to address my comment, so I’ll say this: I mentioned only temperature, and it is a fact that for about 20 years we were told that, because the surface temperature could be seen to be rising, it was simple to conclude that there was a problem of our own making. From time to time people said we cannot derive an average temperature for such a complex and unbalanced system as the troposphere. Climate warmists weren’t much interested in discussing that and insisted it was simple: temperature up, make your oil use go down. But now it’s different, because the problem must remain, even in the absence of clearly evident warming. So the temperature has become a complex issue and I agree it is complex. <"…the fundamental properties relevant here relate to the symmetry and vibrational/rotational modes of these molecules"
You're still away with the fairies aren't you Ken? I haven't questioned the absorption spectroscopy or the "vibrational/rotational modes of these molecules" – you are misconstruing and introducing strawmen. The issue is not the absorption spectrum (and I haven’t said it was – you’ve misunderstood as usual Ken), the issue is CO2′s performance as an energy transfer or forcing medium. The forcing is exhausted past 200ppm (see literature below) but the transfer properties are utilized in refrigeration and the thermosphere i.e. the notion that GHGs “trap” heat is only valid up to the point of thermalization (but only if it is re-energized) but after that the gas is an effective transfer medium (a coolant and used as such by industry). So now that you’ve contradicted yourself and tied your argument into a hopeless knot, you’re back-peddling and looking for a way out of the mess you’re in. But then, you’re an expert back-peddler Ken – I’ll give you that. Richard, you may have been told that by a voice in your head, or by one of your “science team” who wish to remain anonymous. But it is not what the experts have been saying. Climate scientists, through the IPCC, have been very conservatice and qualified in their assessments. While they have agreed with everyone else that evidence for increasing global temperatures is unequivocal, they have said only in AR4 that human responibility for part of this warming was only probable. I expect their assessment will be firmer in the next review. But please stop misrepresenting the science and the scientists. Want the hell, am I asking. Isn’t that the whole purpose of this blog? A coolant is a fluid which flows through or around a device to prevent its overheating, transferring the heat produced by the device to other devices that use or dissipate it. An ideal coolant has high thermal capacity, low viscosity, is low-cost, non-toxic, and chemically inert, neither causing nor promoting corrosion of the cooling system. Some applications also require the coolant to be an electrical insulator. While the term coolant is commonly used in automotive and HVAC applications, in industrial processing, heat transfer fluid is one technical term more often used, in high temperature as well as low temperature manufacturing applications. Another industrial sense of the word covers cutting fluids. The coolant can either keep its phase and stay liquid or gaseous, or can undergo a phase transition, with the latent heat adding to the cooling efficiency. The latter, when used to achieve low temperatures, is more commonly known as refrigerant. Inert gases are used as coolants in gas-cooled nuclear reactors. Helium has a low tendency to absorb neutrons and become radioactive. Carbon dioxide is used in Magnox and AGR reactors. Carbon Dioxide (chemical formula is CO2) – is used as a coolant replacement for cutting fluids. Refrigerants are coolants used for reaching low temperatures by undergoing phase change between liquid and gas. …………Carbon dioxide (R-744) is used as a working fluid in climate control systems for cars, residential air conditioning, commercial refrigeration, and vending machines. Sorry, Ken, I have misled you. Over the last 20 years I’ve been reading that kind of argument and listening to populist alarmism on the television news and in the newspapers, not in scientific papers. Did you not encounter it? In my considered opinion, although that might not have strictly reflected conclusions from any scientific papers, the scientists cannot stand free of responsibility for allowing those views to propagate. They could see their names and their views being misrepresented and yet I never heard them calming the rhetoric or diluting the anxiety of hundreds of thousands of thoughtful people around the world. And that’s just in New Zealand. By the way, please don’t be rude — you mischaracterise the purpose of this blog. I will ask Richard C to stop being rude to you, but I ask you to play your part, too. We may disagree, but we needn’t be disagreeable. I appreciate, Richard, your trained monkey with a keyboard is embarrassing. But I am not being rude. Just short of patience. I have enough going on in my life without responding to such childish arguments. As I said its a waste of electrons. And I don’t want to waste valuable and limited time on such rubbish. So you admit scientists have not been misinforming you. Well what about withdrawing your silly article “Are we getting warm yet?”? And apologising for such dusgusting propaganda and lies. The high court found even your subsequent script was malicious, let alone that one. Bit hypocritical of you to admonish scientists for not holding back extreme activists, isn’t it, considering your role in attacking scientists? You certainly haven’t held back Mad Monckton with his scandalous lies and attacks! Quite the opposite. One good thing that has come out of this denial campaign, climategate etc., is that some really good scientists like Michael Mann have recognised that they need to front up and correct the misinformation. And especially to stand up for the integrity if scientists, and good faith science, currently under attack. And these people are putting the science into context, with a strong recognition that somehow we must communicate the real nature of scientific knowledge – which doesn’t always answer questions completely. That we need to somehow get people to understand the actual degree of confidence we have in our findings and models. All these things are honestly and openly being discussed in the scientific communities. Ken, I found it hard to get past “your trained monkey with a keyboard is embarrassing.” But I made it to “So you admit scientists have not been misinforming you” and nearly choked on my coffee. I have to say you missed the vital point again. Scientists have been misinforming everyone. What else is the result of their refusal to intervene? What else do we take from the hypocrisy that cherry-picked the dendro records and cynically slanted the mathematics that produced the hockey stick? Then you boldly libel us for our activities in trying to discover what NIWA did to the public temperature record. Remember this: they refused to tell us what they did. Have you ever asked yourself why they refused to tell us? Don’t say the judge found something malicious, for he did nothing of the kind. Get your facts straight. Anyway, if you can’t recognise an olive branch when it’s offered you deserve no further consideration. Now get lost. Go back to your own blog and make a fuss where nobody listens. You are actually most disagreeable. It seems Ken’s parachute is wide shut. There is no reasoning with such zealots. He has his world view, firmly set in concrete and no amount of reason will soften him. He cannot read but that which blazes from the page to reinforce his carboncentric mania. All else is lost to him. He is a lost cause. As he points out, “don’t want to waste valuable and limited time on such rubbish.” As for defending Mann! OMG!!! Never mind, move along, he’s clogging the airspace with his closed parachute. Bye-bye Ken. Yes, Richard, I can recognise such a false “olive branch” when I see one. Actions speak much louder than words and your actions have revealed your position. The judge did describe you continued activity that way – you don’t fool such people easily. And for me slandering honest scientists and their science is a key point. The disgusting attitude towards our NIWA scientists and Mann is a key indicator. Get back to me when you are honestly wanting to withdraw and apologise for that behaviour. Abstract. Solar activity, together with human activity, is considered a possible factor for the global warming observed in the last century. However, in the last decades solar activity has remained more or less constant while surface air temperature has continued to increase, which is interpreted as an evidence that in this period human activity is the main factor for global warming. 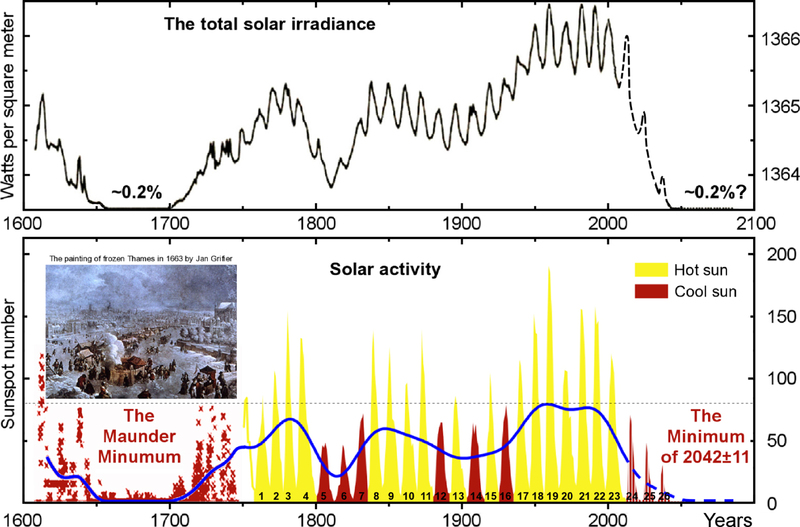 We show that the index commonly used for quantifying long-term changes in solar activity, the sunspot number, accounts for only one part of solar activity and using this index leads to the underestimation of the role of solar activity in the global warming in the recent decades. A more suitable index is the geomagnetic activity which reﬂects all solar activity, and it is highly correlated to global temperature variations in the whole period for which we have data. After listening to Ken spout off I need some sauvignon blanc. There, I got it right! Count the day lost you don’t learn something. As for Lord Monckton: I bow to no man as my lord, but I bow to Lord Monckton. See the Mad Monckton support group in NZ is breaking apart. Apparently he has not been able to support all the different conspiracy theories. So the Chem Trail people are now bad mouthing him. Accusing him of being a double agent. I’m sure you’re right, but just what are you talking about? Please give some references. Incidentally, it’s a big surprise to see you back. God, the Potty Peer is such good value. He’s now made a public attack on Victoria University, jthreats and all. Puts the whole thing in writing. It’s not very funny keeping people out of the university because of prejudice, and telling bald lies about a man is wrong, even if you’re a professor. Anyway, universities have stood up for discussion and dissent for centuries. They’re supposed to keep everyone honest. Now, they are themselves devious and dishonest. But let’s see what they do in this case. Will you explain your strange comment about conspiracy theories, “Chem Trail people” and double agent? Yes, anything to dull the pain. The irony is that Monckton goes on about academic freedom while trying to muzzle academics from speaking their mind. UVic should call his bluff. He doesn’t appear to have sued UTas as he threatened to do to Tony Press. I suspect that Dr Press is probably employed by the Antarctic CRC rather than the university itself. It would be interesting to know what the fraudulent graph is. If it’s the hockey stick, papers supporting it are running about 12:1 in favour. You exhibit some cognitive dissonance, Simon — otherwise known as the inability to apologise. Monckton has not attempted to muzzle the academics and if you think he has, please say what he did. He appeals to their leadership to enforce its rules, for they have denied him the opportunity to speak there, in defiance of the rules. Rules, I might add, that were put in place by the university itself, without the compulsion of legislation. Why don’t they apply them equably, do you think? Are you including Marcott et al in your 12 Simon? BTW, do you use the word “favour” in political or scientific terms in this instance? But Monckton does not limit his letter to a complaint about being unable to speak at the University. He is perfectly entitled to speak on the university grounds, using a lecture theatre and equipment is another matter and is subject to availability. Instead he alleges dishonesty, lack of integrity, and bringing the university into disrepute. Strong words and I’m unsure how one could lay a complaint of scientifc fraud to NZ police. The same way these clowns took their stupid claim of NIWA fraud to the high Court – with as little chance of success. Actually I think it did have a measure of success in that it exposed NIWA’s reluctance to show their working methods to the public and parliament (I wonder why they hid them). Interesting that National gutted the ETS shortly afterwards and refused to resign the Kyoto agreement – perhaps the 2 things are related. Maybe the govt. would’ve done it earlier if they’d known how NIWA had been arriving at their results, and how we don’t actually have an official national temperature record after all. I wonder what Gluckman had to say about the methods employed by them when advising the PM. Ah well, water under the bridge and all that. The important thing is that the ETS exists pretty much in name only these days for cosmetic purposes to our trade partners, and NZ is no longer chained to the Kyoto protocol – much like the rest of the world. As to your other remarks, you are correct in saying he’s “entitled” to speak, but they told him he was unwelcome to speak. In addition, three professors made public remarks against him. I speculate that, since he was refused permission to speak, he then raised the other injuries, which are substantial. You really should read Christopher’s complaint to avoid further mistakes. The fraudulent graph is from the IPCC AR4. Surprised? Yes, I’m with James on that.